Ok, so apparently there is a breed of carp called "asian carp" that has invaded the Mississippi River and eaten all the other fish. Not only this, but the Asian Carp are threatening to invade the Great Lakes, where they would presumably destroy a $7 billion fishing industry. This article uses the phrase "marauding carp" to describe these fish. They grow up to 40 pounds and four feet long, and are able to jump about 10 feet in the air. Sometimes they leap out of the water and attack boaters, occasionally causing concussions and broken bones. (its true, Wikipedia says so). They eat and reproduce so fast that they are able to destroy native fish populations. Apparently they are so dangerous that the government is spending $78.5 million to find a way to keep them out of the the Great Lakes. There is only one route between the Great Lakes and the Mississippi, a manmade canal. Naturally, the government is rejecting the idea of simply laying a net across this canal, which could be done by a bunch of illegal immigrants for about $5.78, plus a ride back to the nearest 7-11. 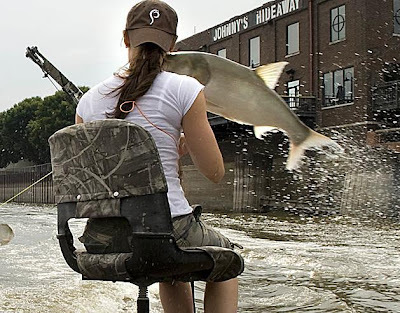 Why is this woman holding a bow and arrow and sitting in a camouflage chair in the middle of a lake? Why is she not the slightest bit concerned that a gigantic carp is flying into her head? Photo came from this page. All well and good. The most obvious, cheapest and easiest idea has been nixed. Fine. That means that the $78.5 million is still out there, waiting for someone to get rid of these carp. For the record, there is a $25 million reward for Osama Bin Laden. The carp, apparently, are more than three times as dangerous as Bin Laden. We've already outlined a good way for you to catch him, so now we are going to give you a good solution for stopping these crazy marauding carp. My guess is that there are at least 100 ways to destroy these carp for less than one million dollars, but since we have $78.5 million to work with, we might as well take it. 2. Everytime you catch a marauding carp, kill it. Everytime you catch something else, throw it back. 3. Eat the marauding carp. If you don't like carp meat, then make cat food out of it or put it in someone's car who you don't like. *Yes yes, I know, just because people in China eat it doesn't mean its edible, but again, cats could eat it, and then the people in China could eat the cats. Problem solved.